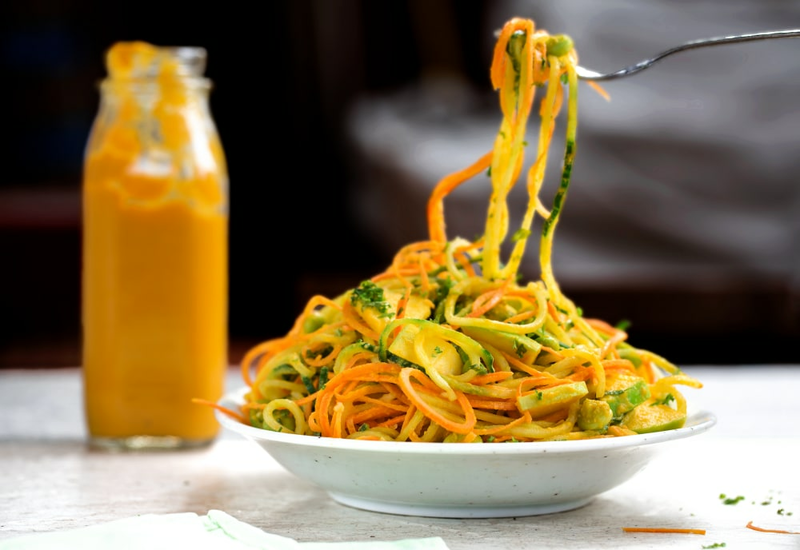 Spiralized vegetables sparkle with fresh flavor when allowed to shine in a fresh salad, but the real star of this recipes is the bright and tangy dressing, which would be just as brilliant on any combination of vegetables or even served alongside cut crudité as a standalone dip. This recipe makes more dressing than is needed for the immediate side dish, but you may still want to double it to ensure plenty of delicious leftovers. Extra dressing can be stored in the fridge in an airtight container for up to a week. Per Serving: 173 calories; 12g fat; 14.3g carbohydrates; 3g protein; 1mg cholesterol; 203mg sodium. This cucumber salad was amazing! The creamy ginger dressing is so delicious, I doubled the batch to save for later use. I also loved the sweet and sour green apple added to the dish, wonderful! I really liked this salad, it was very fresh with a lot of different flavors. From the apple to the cilantro to the ginger, this recipe is both healthy and delicious. I paired it with a salmon filet and it was delicious. 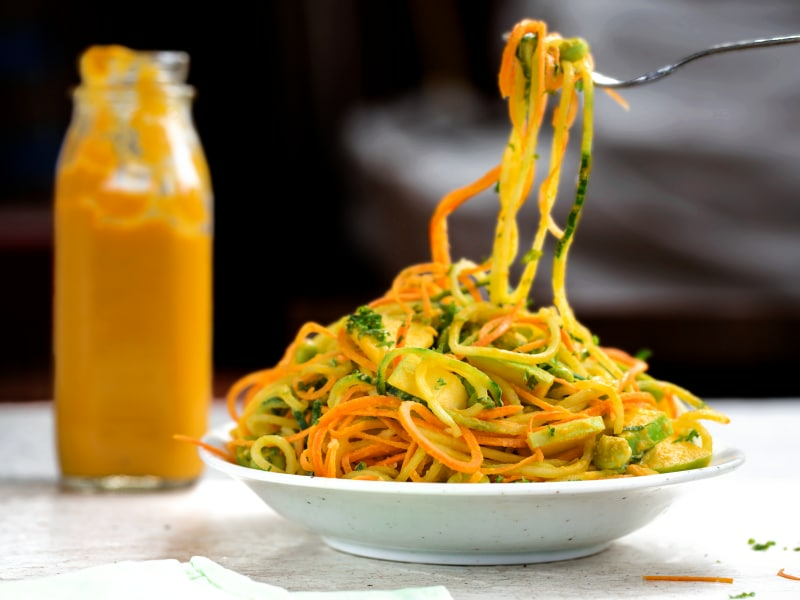 I thought the carrot dressing with the spiralized carrots would be a bit much, but surprisingly it worked well. I used honey instead of maple syrup as a natural sweetener. 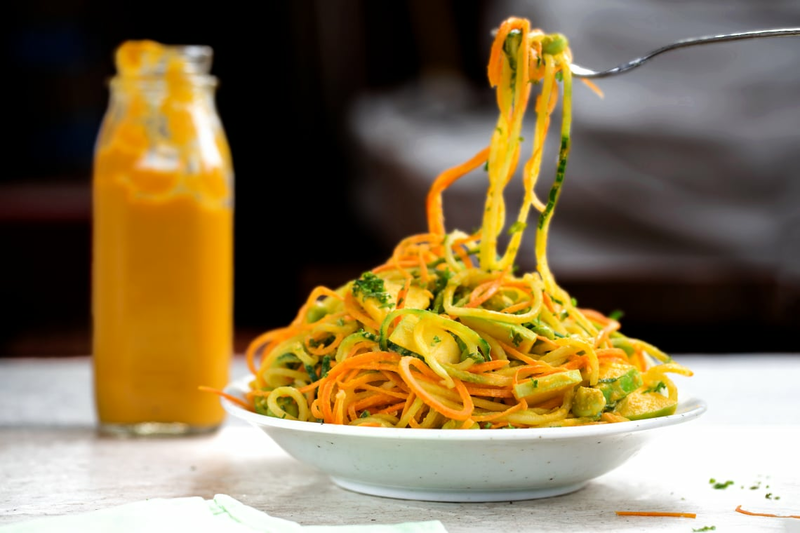 I'm obsessed with these spiralized veggie salad. The dressing was so tangy, especially because I used a little extra ginger. I also used agave instead of maple syrup. Loved everything about this dish, and will definitely make it again. I'm not sure what the English cucumber is so I used two of the smaller cucumbers and spiralized them for this salad. I also used three carrots. The creamy carrot dressing was my favorite though. I used just a little less ginger, and it turned out great.